I haven't posted in ages so here's an update. I've been spending quite a bit of time playing with sound-chips for my locos, working on a section of the club layout and trying various weathering techniques. On the sound-chip front I've installed Howes sound chips into a Bachmann Pannier Tank loco, 2 Hornby GWR Flying Bananas, 2 Heljan Class 33 Cromptons and a Bachy Class 108 2-car DMU. They were all quick and easy installs except for the Pannier...that required a bit of chopping and cutting but really it was pretty straight-forward also.I'm very impressed with both the sound quality of the chips and Howes' service. My local club, The British Model Railway Club of Montreal is building a new exhibition layout, called Allingham, after the last UK WW1 vet who just passed away. one could say its an amalgam of SR,GWR and BR(W) practice. I adopted a section that has a fan of 3 sidings and were we decided to put an industrial warehouse. So I built a warehouse useing DPM parts and various bits and pieces...I know, I know DPM are US HO prototype and scale...but trust me it looks pretty authentic...or so the British born club-members tell me. BTW...the name on the warehouse is in honour of one of our club members, Hugh Rowland, who passed away about 2 years ago. A sweeter guy there never was and he is sadly missed by all. modelling days over 35 years ago. Up until recently I've basically restricted myself to useing powders, washes and dry-brushing enamels and some acrylics...until I ran across a couple of web-pages and a particular book that is. 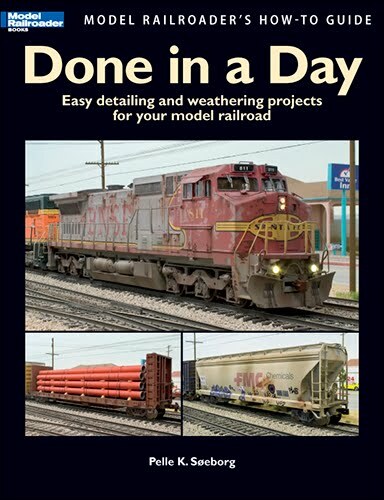 These are great resources for weathering info...the modeltrainsweathered.com page requires you to register to access all the info but its painless and well worth it. Rich Divizio, the page owner, is a heck of a great modeller and very helpful, as is Rob Ferreira, the owner of the scratchmod webpage. on an old Hornby Terrier....and I have to admit that I'm very pleased with the results, especially considering that its my first real attempt at using oil paint and this particular technique. it's not as red as it seems to be in the pics...I promise!